I loved reading about all of your writing spaces on my last post. It’s interesting to see our similarities and differences as readers and writers, and I’ll be sure to find other aspects of our lives we can share soon. But, today, I wanted to suggest a movie to see this weekend! 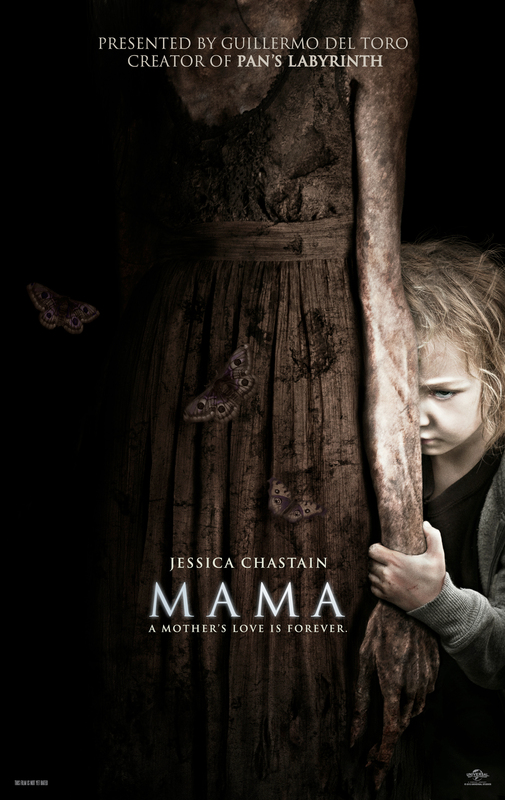 Last night, I saw Guillermo del Toro‘s new horror movie, Mama. After five years, Lucas’ nieces, Victoria and Lilly, are found abandoned in the woods, and no one can understand how two little girls survived the harsh elements. Hoping to give them a home again, Lucas and his girlfriend, Annabel, take in the disturbed children–but the girls are more troubled than they could image, and it wasn’t the forest that changed them. Not to toot my own horn (I’m sure you all are the same, as avid writers and readers seem to have a knack for it), but I’m normally really good at guessing plots, and I didn’t see the ending coming. As always, the producer of Pan’s Labyrinth and Don’t Be Afraid of the Dark delicately creates a twisted backstory for a complete and unique horror experience. If you’re looking for a scary movie to go see with friends, go out to the movies and watch this flick. You won’t be disappointed. Check out trailer via IMDb here. ← Writing Tips: What’s On Your Desk? Yeah, that ending was definitely not your typical Hollywood horror film ending. Funny how some people thought it was a bad ending. I guess people always complaining about how there’s never anything original in horror films would balk at something very original. I got your book in the mail yesterday!!! So excited to start reading it. Good to hear! I hope it arrived safely and quickly. l didn’t see the end coming either and loved the look of it. For once the style augmented the substance. Check my review. Cheers on a 40 below zero morning! We’re having a very mild winter here, and I’m checking out your review now. Haven’t heard of this one but it sounds so eerie. Haven’t seen it yet, but really want to. On my list to see – thanks for the recommendation! You should tell me the ending. Now, I’ve gotta know LOL. I love horror movies, but I’m too chicken to watch them on the big screen. I wait ’til the DVDs come out. I would over email but not on the website (I’d hate to accidentally spoil it for someone). It’s really good 😀 I normally wait for DVD too because movies are so expensive, and I don’t have a lot of free time to go to the theaters. WOW! Thanks for sharing! It’s crazy, because, if you’ve seen the movie, you know exactly what scene this is. Thanks for this review!! I really want to see this, but I wasn’t sure if it would really be as scary as the preview shows, or just stupid..